As I still struggle to comprehend how I have managed to write 400 posts for my website, I am faced with the idea of another retrospective review. I have already written about a couple of X-Men books that made me fall in love with comics, but I have spent little time with the other hero that spawned such adoration: Batman. As every teenager did, I loved the cartoon and the films that came out in the eighties and nineties, and subsequently started to collect the Batman and Detective comics titles. Slowly I came across the essential texts and as much as I loved Dark Knight Returns, it was not as impactful on a visceral level as Batman: Year One. This is the comic I still recommend to people to read, because it captures the true essence of the city in which Bruce reigns the night. 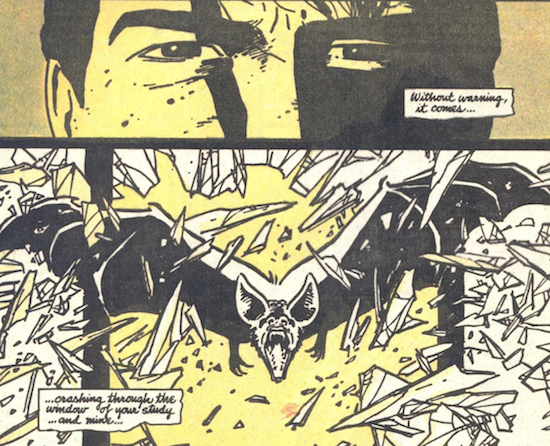 That is not even the most important part of year one batlore, because as compelling the stories of Bruce Wayne are, they are not quite as guttural as that of Jim Gordon. Frank Miller needs no introduction but the scaffolding of this book is very precise and purposeful. The story of two defenders of the city returning to Gotham to start their crime fighting careers is fantastically juxtaposed. The opening scenes are poignant enough where Jim despises the train because it is unsafe and truly reflects the city, whereas Bruce flies in comfort and has similar sentiments. Only he regrets not taking the train, failing to stare into the eyes of Gotham. The original artwork is so gritty and dark that even when the colouring is brighter, it still has that insidious feel to it. Both Bruce and Gordon set about setting up their new lives. For Jim it is meeting new colleagues and slowly learning about police brutality and corruption, for Bruce it is reconciliation with his home and Alfred, and visiting his parent’s graves. 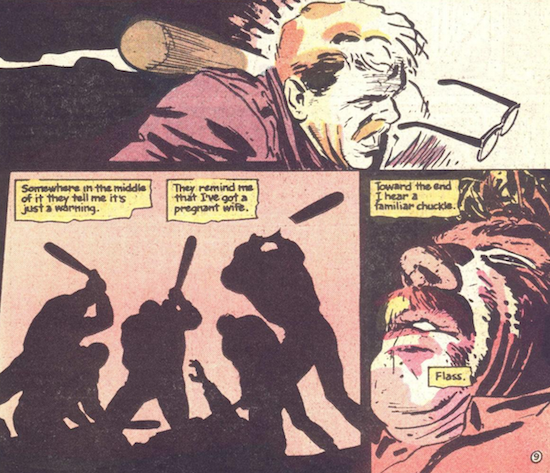 It is such an impressive opener because in such a few pages the GCPD lay out the ground rules, albeit in the beating of Gordon, and Bruce walks around the East End and enters an altercation, resulting in him being shot by none other than a policeman. These pages are so grim in their direction that it makes the relative successes of both men all the more impressive. Miller writes quite emphatically and what becomes a little overdramatised in the future, remains perfectly apt for the Gotham he has created here. There is a lot of narrative boxes depicting the thoughts of Bruce and Jim but they are so integral to the contrast he is trying to achieve. The delinquents are suitably written and the story is allowed to breathe through the art. The inking is so heavy that it is difficult to make out details but they simply are not needed. The fighting is not fluid across panels but it is clear what is happening, especially with the use of anguished close ups and mid battle poses. The night scenes are bereft of natural light as the yellows and reds of the city lights are covered in shades. This adds a degree of terror to the violence that both protagonists entertain. Gordon survives his attack and decides to take on his partner face to face. He initiates a set up where he makes a stand and punishes his aggressor so heavily that he will never admit to truth. Gordon knows this and plays on the idea in order to let them know he is not falling in line with his colleagues. Bruce sits broken as a silhouette in his armchair talking to his long gone father. Gotham has no fear, it has no respect for the law let alone morality. As he sits contemplating the night and ponders upon leaving it all behind. And that is when it happens, the iconic moment where a Bat flies in destroying a window. It is time for him to become a bat. 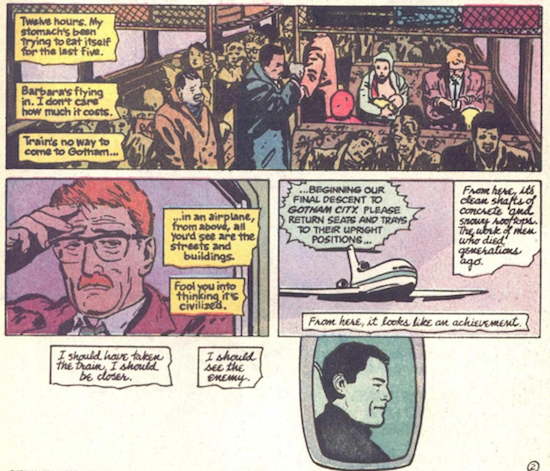 Both Batman and Gordon find some restitution in their initial losses and thus begin the journeys that will take them to their ultimate destinations. Gordon is a just a man, faced with the struggles of an impossible job with little support. His infidelity is his weakness and he knows he has failed his wife. Though he maintains a degree of integrity in being honest with, albeit to prevent GCPD intimidation, he ends his illicit relationship. The toll on his person physically and mentally is so immense that it affects his judgement. One message is clear throughout the book when it comes to James Gordon, he needs help and cannot do this alone. This is where Bruce’s and Jim’s stories intertwine. Whilst donning the Batman outfit, he is far from the sleek and efficient fighter he eventually becomes. There is a great scene where he holds someone from a balcony, trying to stop him from falling to his death, whilst overcoming another assailant. It is quite amusing how terrible he actually is. As reports come in of a costumed vigilante, the GCPD make him their top priority. It becomes more political posturing than crime fighting, as the resources made available become extensive. The scenes where he is trying to evade capture in a mid demolition derelict building are intense and impressive, but not as impressive as the bat call which brings his secret weapon flying from his cave. 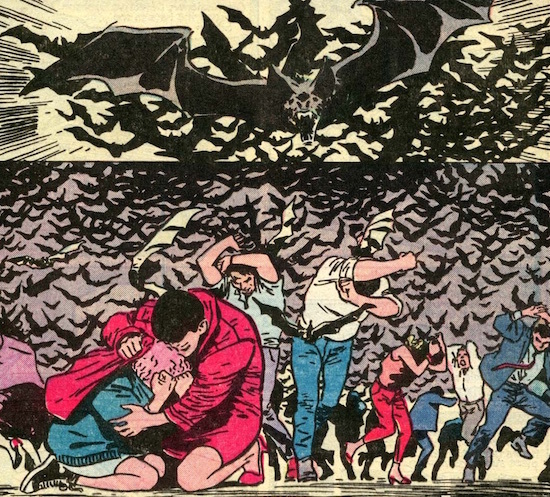 The final scenes see Gordon’s family under attack and Bruce, as Bruce, comes to their rescue. In saving their newborn baby, the friendship between an honourable policeman and a masked vigilante truly begins. Miller’s story is far from a book about Batman because Gotham is the real feature of the book. It is a dark, horrid and malevolent place and Mazzuchelli bears this out with such texture. It is city that needs saving. Then bring in two heroes from completely different backgrounds, working with a common goal from both sides of the tracks. One is a rule breaker who keeps a secret identity and is essentially a criminal and the other operates within the boundaries of the law even though those around him don’t. It begs the question who has the easiest time in fighting crime? Bruce enters this voluntarily and takes risks and cuts corners. Gordon has dedicated his career to his task but has to fight within his own team to even have the chance to succeed. There is an added risk of his home life being completely vulnerable to attack from criminals and the police. We have all seen how Gordon suffers in the future. It certainly seems easier to be Batman, and as he keeps himself isolated from the world socially, there is less to lose if he dies. Miller’s message is one of a mutual partnership; Batman needs Gordon and Gordon needs Batman. Personally I have always found Jim’s story more interesting as he seems to suffer more in his mission than Bruce. As much as I love watching Bruce as a young Bat, I really feel moved by Gordon’s story. So I have always describe Year One as a story about Gotham and about the true importance of the soon to be Commissioner James Gordon. There is more to Batman than Batman and there has never been a better Batman book ever. I will see you in another hundred posts. Previous PostThe Theatre List 29/10 – Wait! What do you mean no Marvel?